Oregon Winery Dinners in the Field Series Casual wine dinners through the rest of 2017 featuring wines of notable wineries. The series of events was started by chef Pascal Chureau who envisioned communal dinners at wineries or in an open field, barn or tent. Prices are very reasonable at $85 to $90 per person for a six- or seven-course dinner and wine. Featured wineries include Ponzi Vineyards (July 15), Domaine Serene (August 26), and Penner-Ash Wine Cellars (September 30). At each event, the winery joins a local food producer or farm. Visit www.fieldandvineevents.com. 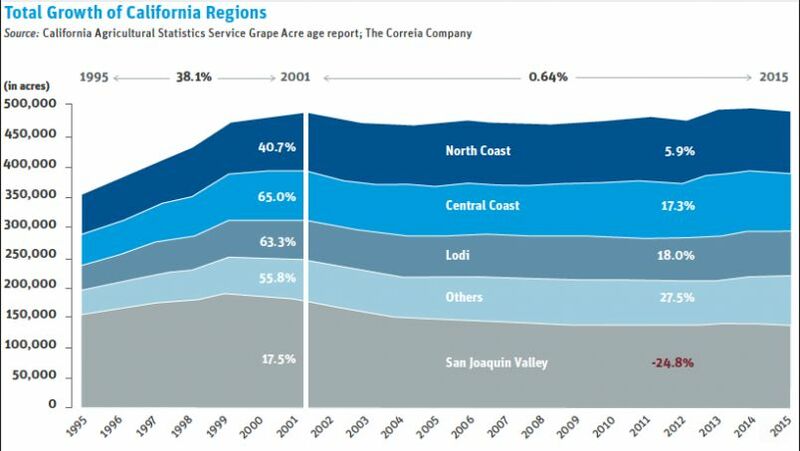 Sustainable Sonoma County Sonoma County Winegrowers (SCW) plans to have Sonoma County be America’s first 100 percent certified sustainable wine region. This is a first-of-its-kind model in the global winemaking industry. 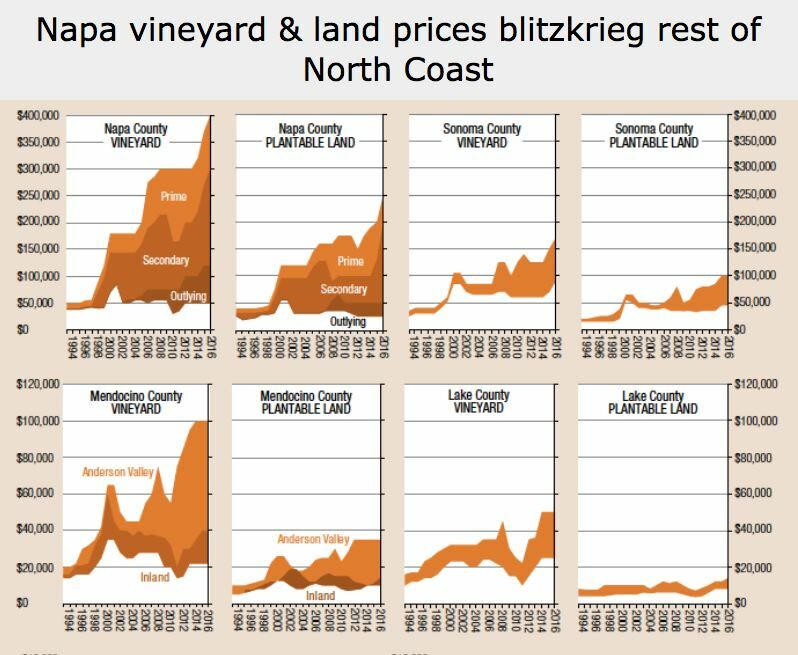 Sonoma County is now well on its way to become 100 percent sustainable by 2019, with 85 percent of the vineyard acres sustainably self-assessed and more than 60 percent of the vineyards certified sustainable by a third party auditor. Some experts believe that sustainably grown grapes improve the quality of wine because sustainable vineyard practices and technologies allow growers to monitor their vineyards, vine by vine, to ensure proper irrigation levels. Another aspect of sustainability efforts is matching the right rootstocks and clones to the soil and terroir of each vineyard site. There are three ways you can experience Sonoma County’s Sustainable Wines: (1) Free, self-guided vineyard walks provide Sonoma County visitors with an interactive, educational experience at nine of the region’s wineries - www.sonomavineyardadventures.com; (2) During harvest season, SCW host a 3-day, immersive Wine Country harvest experience at which participants get hands-on at sustainably minded vineyards and meet some of the region’s premier winegrowers and winemakers - www.sonomagrapecamp.com; (3) Simply come to Sonoma County and visit. Uncork a bottle of wine that you know was crafted by farmers who are committed to the quality of the wine and to preserving the lands of Sonoma County for future generations. Total Eclipse Celebration at Willamette Valley Vineyards The Willamette Valley Vineyards Estate is in the direct path of the 2017 solar eclipse and the winery is celebrating with wine tasting, educational presentations and live music. Each attendee receives a commemorative 2015 Solar Eclipse Pinot Noir and food pairings will be available for purchase. Admission is $100 per person ($75 for Wine Club Members). Call 503-588-9463 to reserve your space. Other wineries in the Willamette Valley are having similar celebrations on Monday, August 21, in the evening. 2017 Oregon Wine University® Wine Discovery Series The first two classes being offered this summer include Discover Oregon® on Tuesday, June 27, from 2-4 pm, at Southern Oregon University led by Greg Jones, PhD and Fundamentals of Our Region on Tuesday, July 18, 2-4 pm, at Southern Oregon University again hosted by Greg Jones, PhD, delving deeper into comparing Oregon’s growing regions to other famous growing regions of the world. Tickets are $39 for consumers. Visit www.theOregonWineExperience.com. More classes to come in August. Summer Concert Series Look to these wineries for a series of performances by headliners: Halter Ranch Vineyard, Paso Robles (June-August); Robert Mondavi Winery Concert Series, Napa Valley (July); Summer Sundays at Edna Valley Vineyard, Edna Valley (July-August); Rodney Strong Vineyard’s Annual Summer Concert Series, Healdsburg (July-September); Vina Robles Concert Series, Paso Robles (Ongoing). Summer Wine Events Roll Out the Barrels in San Luis Obispo, June 22-24; Santa Barbara Wine & Food Festival in Santa Barbara, June 24; 21st Annual Atascadero Lakeside Wine Festival, Atascadero, June 24; 14th Annual California Wine Festival, Santa Barbara County, July 13-15; Santa Cruz Mountains Passport Celebration Day, July 15; Salinas Valley Food & Wine Festival, Salinas, August 12; and Sonoma Wine Country Weekend, Sonoma County, September 1-3. 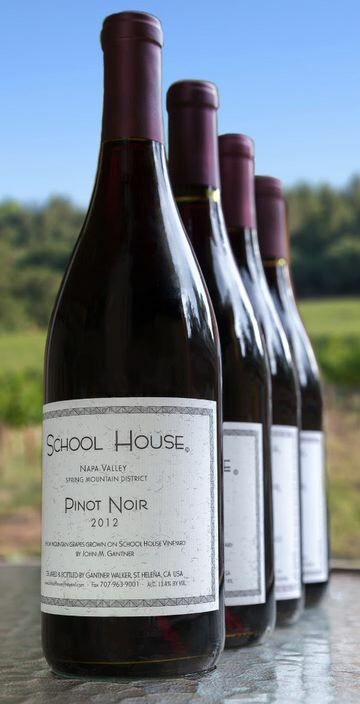 School House Vineyard Offers 4-Year Vertical The owners dipped into the library for an early summer special. A vertical of four vintages of the cult School House Vineyard Pinot Noir, 2009-2012. Price is $360 including shipping. Williams Selyem Magnum Vertical Tasting The June 2017 issue of the Burghound - www.burghound.com - has a report on a vertical tasting of magnums of Williams Selyem Pinot Noir from 1985 to 1996: 1985 Rochioli Vineyard, 1986 Rochioli Vineyard, 1988 Allen Vineyard, 1991 Summa Vineyard 1991 Allen Vineyard, 1992 Rochioli Vineyard, 1994 Rochioli Vineyard, 1995 Summa Vineyard and 1996 Precious Mountain Vineyard. The tasting was held in November 2016 in Burgundy at the home of Becky Wasserman and Russell Hone. Burt Williams supplied the wines and provided much of the color commentary. Allen Meadows, who has been an avid collector of William Selyem wines beginning in the mid-1980s, attended and reported his reviews in the Burghound newsletter. Scores were all in the 91-96 range. To read the full report, you must be a subscriber to the Burghound. 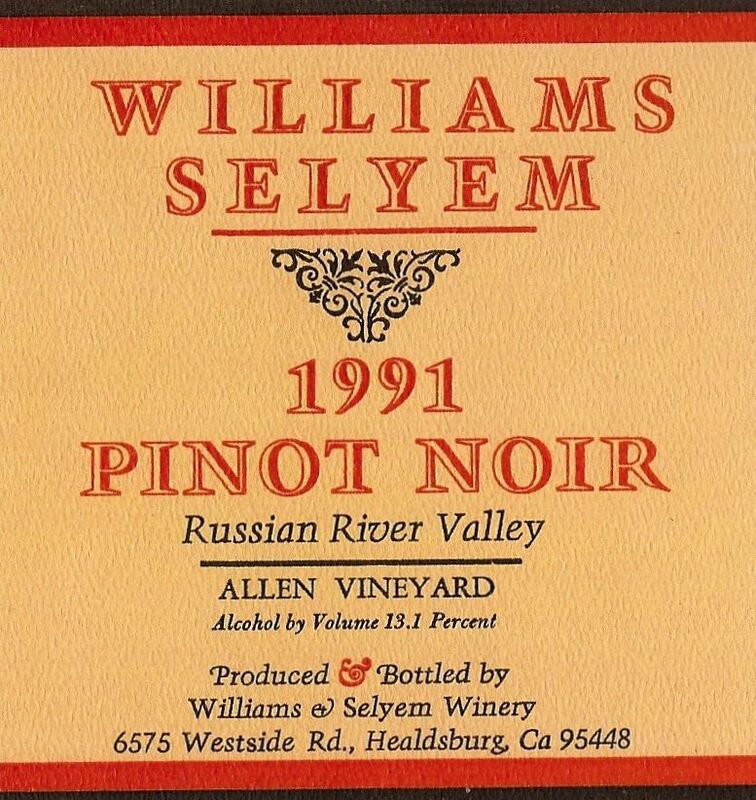 Many older vintages of Williams Selyem Pinot Noir from both 750 ml and 1.5 L format have been reviewed previously in the PinotFile as well. Taste West Sonoma There is a new group of local tasting rooms working together to celebrate West Sonoma County. Wineries include Claypool Cellars, Dmk Wines, Furthermore, Halleck Vineyard, Hartford Family Wines, Iron Horse Vineyards, Joseph Jewell, MacPhail Wines, Marimar Estate, Martin Ray and Red Car Wines. A tasting event was held June 17 at The Barlow Event Venue in collaboration between the Russian River Sisters of Perpetual Indulgence and the Taste West Sonoma group of wineries. 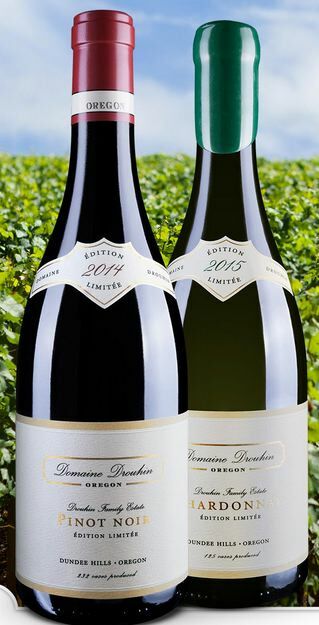 Domaine Drouhin Oregon Edition Limitées (EL) Now Available The Domaine Drouhin Oregon 2014 Edition Limitée Pinot Noir (215 cases, $85)) and 2015 Edition Limitée Chardonnay (125 cases, $65) are from particularly unique blocks of the winery’s Dundee Hills estate, warranting these special, limited production wines. The inspiration for these wines began in 20014, with two exceptional barrels of chardonnay the winemaker Véronique couldn’t fathom blending. 2011 gave the first EL Pinot Noir, sourced largely from one distinct block. This block has consistently lent its fruit to this exclusive bottling. There are limited amounts of these wines available in 750 ml and large formats. Visit www.domainedrouhin.com. 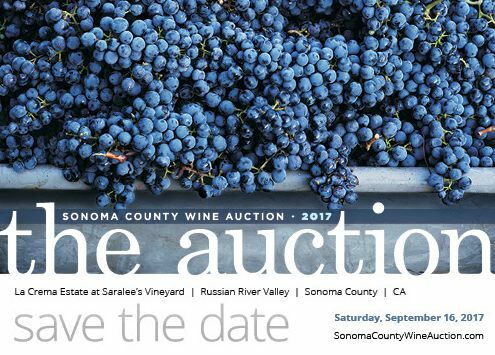 Sonoma County Wine Auction 2017 This annual event will be held Saturday, September 16, 2017. The County’s leading annual fundraising event will at the La Crema Estate at Saralee’s Vineyard. Honorary Chairs are Jackson Family Wines Chairman & Proprietor Barbara R. Bancke and the entire Jackson family. Named one of the top three charitable wine auctions by Wine Spectator, the Sonoma Harvest Wine Auction has raised $24 million to date for more than 95 local Sonoma County charitable organizations. Tickets are now on sale. The weekend package is available via the website and special discounts are offered for Vis Signature and Visa Infinite cardholders. The price for the weekend package is $2,500 per person that includes access to a variety of events. For information, visit www.SonomaCountyWineAuction.com. Single Vineyard Night in Sonoma County The Russian River Valley Winegrowers are hosting Single Vineyard Night June 30, 2017 at Vintner’s Inn in Santa Rosa. 46 of the Russian River Valley’s top wineries will be pouring small-lot, single-vineyard Pinot Noir, Chardonnay, Zinfandel, Syrah and Sauvignon Blanc. A limited number of VIP tickets are available. Visit www.RRVW.org for tickets. Wine Infographic Master of Wine and Bollinger Medal winner Sam Caporn has relaunched her website to showcase her new infographic, The Wine Flavor Tree. This is an aid to help consumers identify flavor profiles found in wine and includes 40 different flavors divided into 10 different branches. Visit the website at www.themistressofwine.com. FedEx Cold Chain Services FedEx arranges specifically designed temperature controlled air cargo containers and exclusive use temperature controlled trucks for pickup and delivery. Temperatures are maintained within tight temperature ranges and temperature monitoring can be provided throughout shipment. The only part of the wine shipment where the wine does not travel or stay in a temperature controlled environment is the morning of the delivery and then the wine is delivered by 10:30 am by priority delivery. There are twelve states where this shipping option is not available. You will see this shipping option now offered by wineries and retailers wine and expect to pay about $10 above normal shipping charges for two bottles shipped by Cold Chain.